There are so many blogs out there that give you checklists of things you need to do or have for your wedding. You could spend hours looking for the right one! Who has time for that? So, I’m not here to overwhelm you with more than what you need. You came to my site for stationery, so that’s what I’ll give you! What do you need before, during, and after the wedding? Well, my dear, I present to you my foolproof Wedding Stationery Checklist! Ivy Thank You cards - available in the shop! 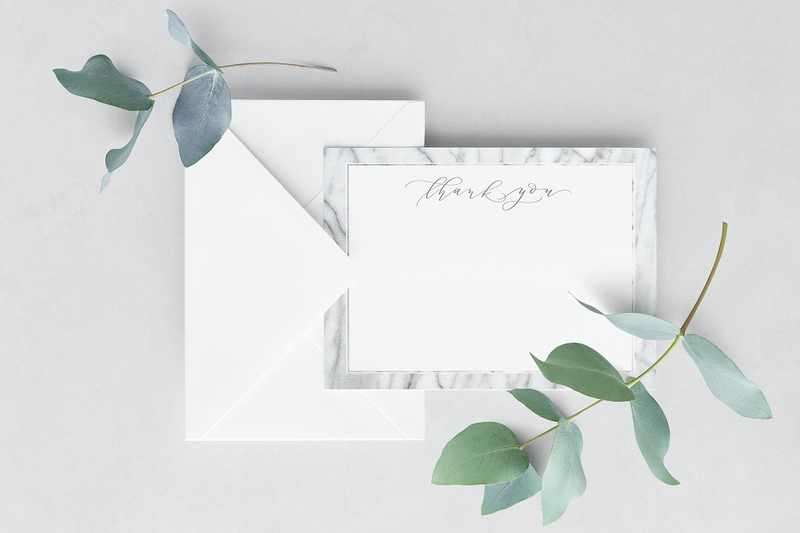 Marble Thank You Cards - Available in the shop! Bridesmaid/Groomsmen Proposal Cards - it’s your turn to ask your friends the big question: Will you be a part of my wedding? Custom cards can really make your friends and/or family feel special. Save the Dates - Save the Dates are an important part of your wedding stationery because it’s the first time your guests will be informed of your wedding date and general location! It gives them time to put it on their calendar and start making arrangements for travel if they need to. Save the Dates are especially important for destination or out-of-town weddings, and while you don’t need to know every single detail just yet, guests will appreciate the heads up! Thank You Cards - Most likely you have had a bridal or couples shower of some sort, and you’ll need some Thank You cards to - well…thank your friends and family for the amazing gifts you’ve received! Also (obviously) prior to your wedding day, here some items you may want to include in your invitation suite! Enclosure card - you can include reception details, accommodations, directions, other wedding events, your wedding website, etc. on this card. Postage stamps - we can even do a custom postage stamp to match your suite! You’ll need to account for postage on your main envelope as well as your RSVP envelopes. These are stationery items you may want to have after your big day. Thank You cards - coordinate your thank you card design with your invitation suite. This will make sure your vision has truly been carried through from beginning to end. Keepsake invitation suites for you and your families - make sure when you order your invitation suites, you order a few extra as keepsakes. Your families will love this thoughtful gift! Thanks so much for reading! If you’d like to have a version of this checklist for yourself, you can download it here. As always, please reach out to me if you’re interested in working together on your wedding stationery! Bright Florals Thank You Cards - Available in the shop!